$10 Donated with every NEW Duvet purchased during April. With NZ’s teenage suicide rate being the highest of any OECD country, that’s totally tragic. Affecting most New Zealanders in some way, no one person or company can solve this issue alone, but we all can do a little to help make a change together. So, for the month of April, every NEW design duvet purchased, Patersonrose will donate $10 towards teenage suicide prevention. Your child’s room should be a fun space, a sanctuary that they love to go to, where they can chill out or bring their friends & siblings. And let’s remember, all our children are different – they have different likes, dislikes, colour tastes & interior needs. But with a little effort, you can make your child’s room uniquely theirs & have loads of fun doing it!! We love the simplicity of black & white in a girls room, especially an older girls room, as shown, using the Jemima duvet. But we also love the addition of colour to give the room some punch & personality, like soft pink, or a splosh of soft blue, with pastel blue sheeting. The beauty of black & white is you can stay smart & simple just with black & white, or add any other hero colour you wish too. Have re-decorating! Hot OFF the production press & created with lots of passion with copious customer contribution via facebook, popups, emails & phone calls, retailer suggestions & full PR team critiquing, we are very proud to introduce our NEW Leon Collection 2018. A rich deep navy blue, metallic grey, charcoal & a nod of red, this quilt cover screams modern, simple, easy & smashingly good looking!!! We wanted to respond to you, our PR customers, requests, while injecting into our collections a boys design that spans across many ages, is modern, yet also classic. What we did NOT want was tizzy, delicate, multicoloured. Oh no!! You, our customer wanted bold & blocky. And so, we have created Leon!! 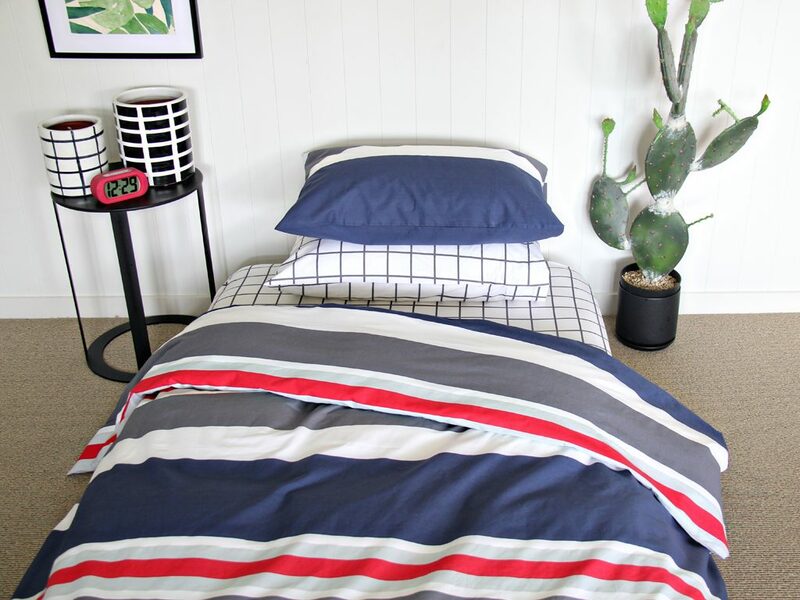 It’s so often hard to find nice boys bedding which is also 100% beautiful cotton, is available up to queen bedding size & is a nice ‘boyish’ design – not too young, yet not adult. Our Leon Collection of bedding is this & more; it’s easy – easy to match the the storm grey sheeting & gunpowder grey rug, easy to dress with cushions for big boys, or transition to a smaller boys bedroom. Boom for boys bedding! 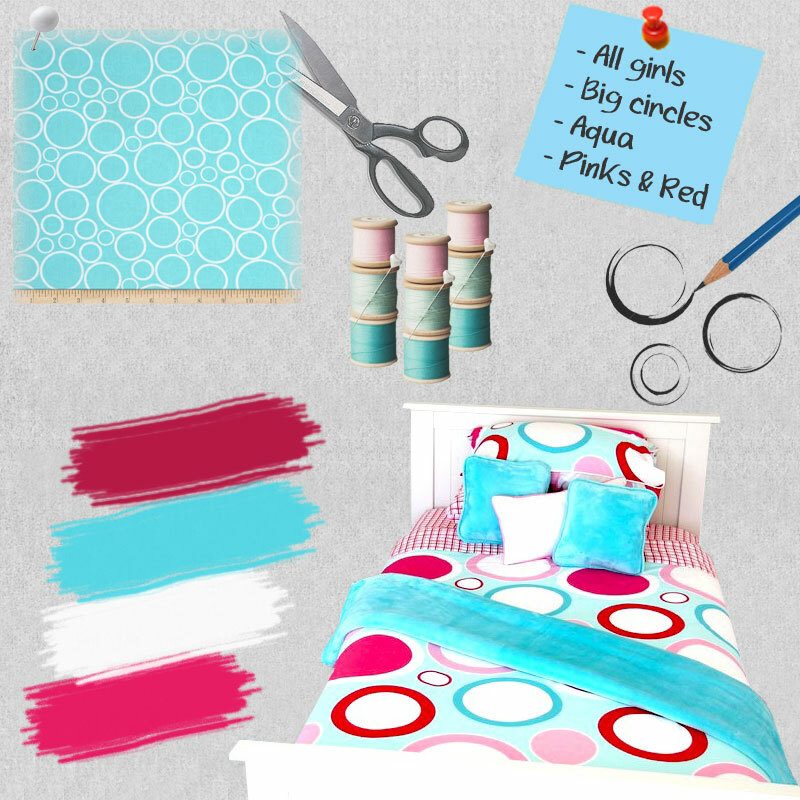 Zoe is a design of when style hits-the-city, with its bold use of fashionable fresh aqua, paired with raspberry & hot pink. Modern use of ultra large circles makes this a very bewitching bed linen design. Zoe‘s versatility to incorporate a range of interior options makes it a flexible collection to create a bedroom design to suit whatever your daughters age & taste; to pair with existing accessories or go wild & re-vamp wall colours. Let’s be honest, there are not very many linen collections which are timeless yet fashionable, edgy but not wacky and manage to make a girls bedroom radiant!! Photo Competition; Our 2nd place winners are …. With great pleasure, we present the rooms awarded 2nd place in our ‘Show us your Room’ photo competition 2017. These rooms were selected for their use of colour, some creative license, a dash of design flair & fab presentation, all creating delightful bedroom spaces. Congratulations! 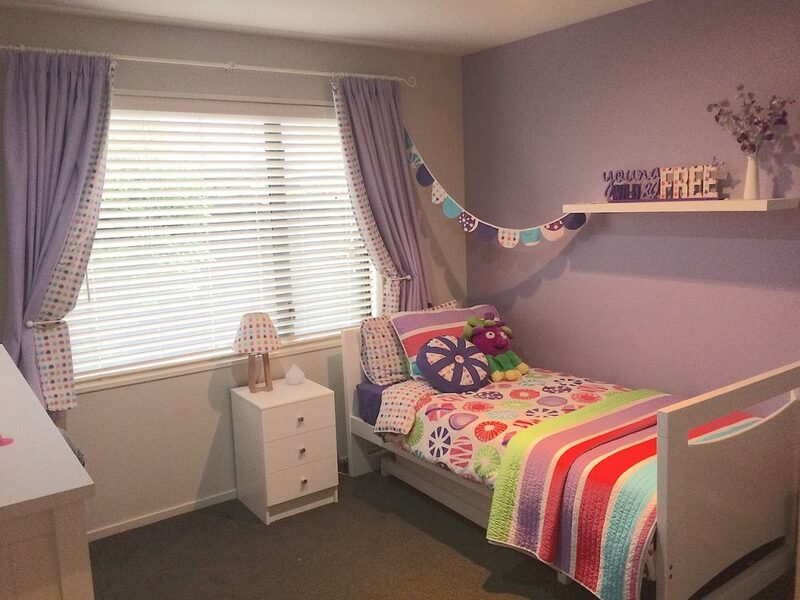 Kathryn Taylor – Christchurch: This is my 3 year olds ‘big girls room.’ It was her birthday present that she upgraded to a big bed and a new colour scheme. She adores it and I love how funky and bright the Patersonrose linen makes it! The curtains are her old cot sheets and stitched down the sides of plain lavender ones. A Gi-Normous thank you to ALL of you who picked up kids clothing, tidied toys, cleared floors, revamped & re-decorated rooms, ‘clicked’ & then took the time ( something very precious to us all ) to email us your bedroom photo entries. Wow! We were blown away with the high standard of your bedrooms!! Many inspired, motivated & amazed us!! Thank you, thank you, thank you! It was certainly a very difficult task to select the winners amongst so many gorgeous bedrooms featuring PR linen & products. After 3 days of deliberation between the 4 judges, consensus was finally made. We did note, the standard of room decoration & attention to detail had increased considerably from our last competition – there are some very lucky children with very special bedrooms & spaces. We also note, the flair & individual creativeness was very ‘WOW’. Well done all of you. You blew us away!!! Our overall winners rooms were selected for their attention to detail, which can sometimes be the simple things. 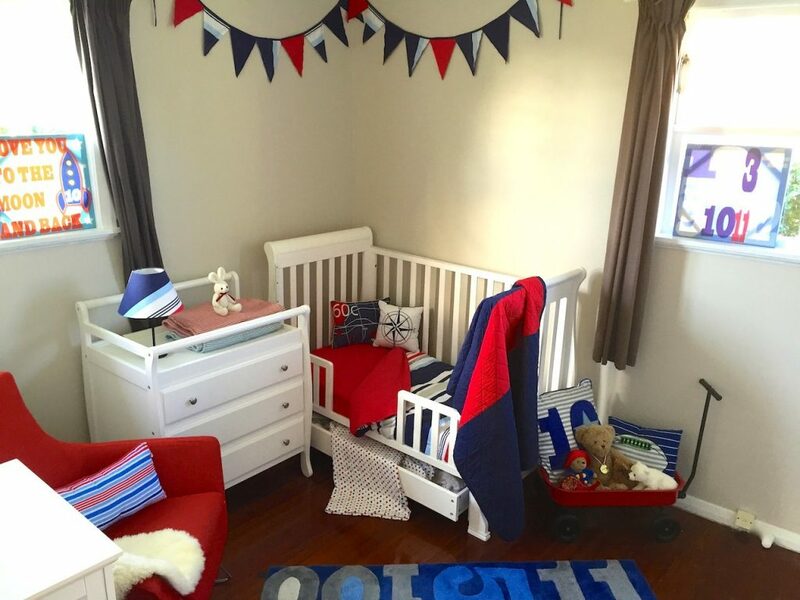 Congratulations to Krysta Ardern with her sons room who was our overall 1st place winner. Rachael Twigg with her daughters room, featuring Lucy linen & Kathryn Taylor with her Big girls room were our 2nd place winners. But we couldn’t help ourselves!. The standard was so high & the judging so close that we have also awarded 3 other entries prizes. Our additional winners were Heather Hoy, Sarah Delaney & Aimee Donaldson. Congratulations to all of our winners & thank you to everyone who entered. Stay posted for further comps & offers …. 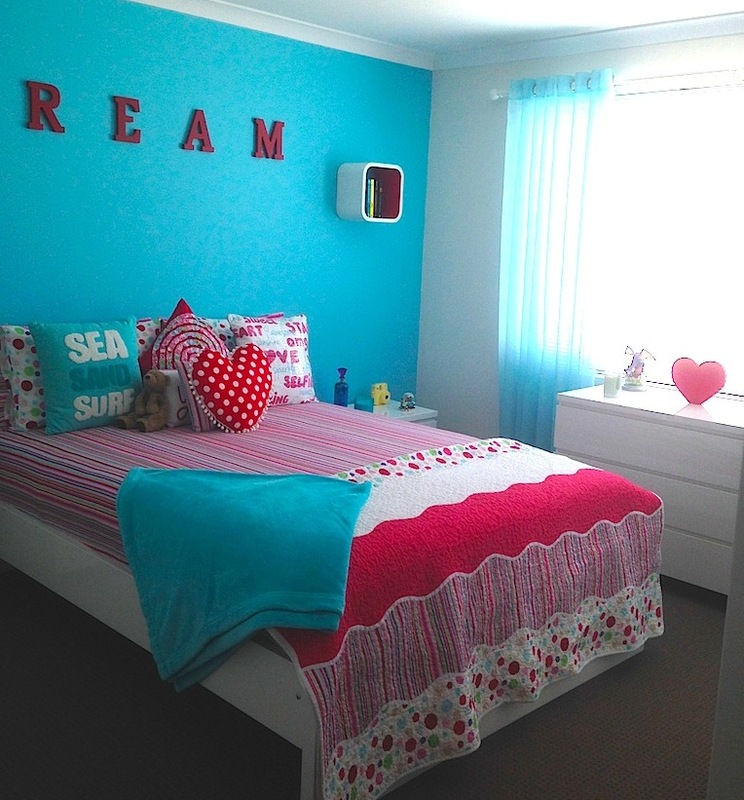 Our Photo Competition 1st place winner, Krysta Ardern, with her sons room. Snap & Win : This month, we spotlight all bedrooms with Patersonrose linen & accessories, so until 6th August, send us a photo of your children’s bed room/s, showing us how you have used any item from Patersonrose. 3 great prizes up for grabs. We will award 1 overall winner a $250 PR voucher & 2 other winners a $100 PR voucher each. Wahoooo!!! It’s simple – encourage your child to tidy up their bedroom( a good holiday project ), make sure the Patersonrose item/s are clearly in the photo, click your child’s room & email your photo to info@patersonrose.com. Be provided with the entrants name, contact phone number & email address. Be emailed separately to info@patersonrose.com. ; Subject : PR Photo Competition. Be emailed to us by Sun 6th August. Please feel free to include a comment, saying what you love about the pictured room ( this is optional ). 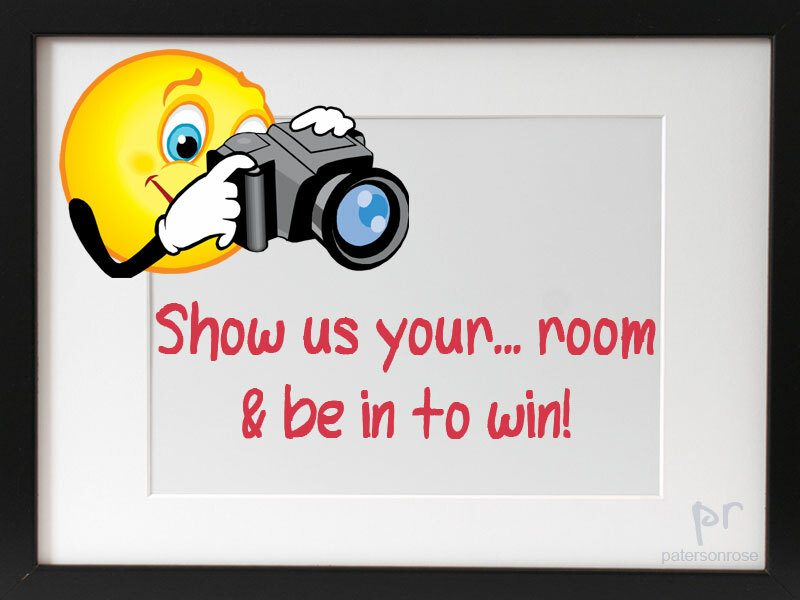 So don’t delay; dust off the drawers, pull up the bedding, pick up the clothes, grab the camera ….. then send us your pics. Entries must be received no later than 11.59pm on Sun 6th August 2017. Photo size to be 1-5 MB. Please ensure the photo is clear & crisp – not dark & small or we won’t be able to see it properly. Enter as many times as you like but only 1 entry per bedroom. Each entry must include at least 1 Patersonrose product. Click for full T’s & C’s. Image : Wills Star quilt cover & comforter, sea blue round rug & kids accessories. Having a new baby is one of THE most exciting times of your life but it can be surrounded with some anxiety – how will I cope? what if I don’t know what to do? where do I find nice 100% cot linen for my new little treasure? Be assured, you will cope, you will find out what to do, & of course, Patersonrose has lovely 100% sheeting, comforters & quilt covers for cots!!! Yay. Our new born babes deserve to sleep in 100% natural cotton that breathes. And one of the most exciting parts of having a baby, is setting up the nursery with the bedding, wall art ( canvases ) bunting, lampshades & a rug; such fun!! 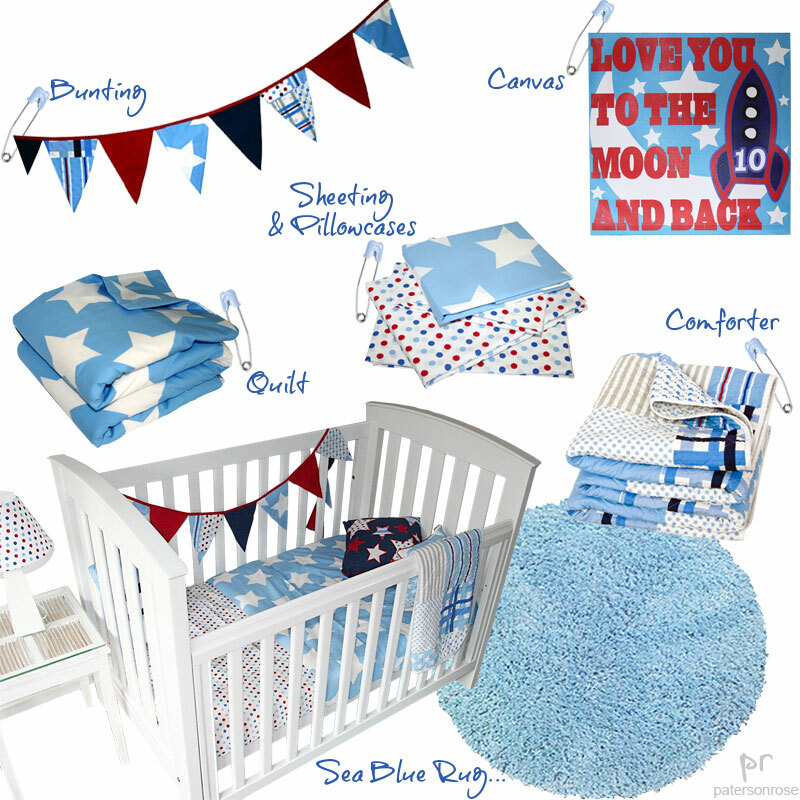 Babies cotton bedding & nice ( not tacky ) nursery accessories are not always easy to find. But now you have discovered Patersonrose, your nursery creation can begin. But be careful!! Patersonrose bedding can become quite an addiction. It’s rather lovely to touch & quite delish to sleep in. Click here for earlier articles on tips of setting up your nursery. Our Feature Design this month – Charlotte. Image : Charlotte quilt cover ( doona ) with the fleece throw; twinkle star canvas; cushions -flutterby, pink fleece & ballerina; fuchsia pink round floor rug. At Patersonrose, we do our utmost to have a range of designs for you to select from; designs for modern homes, contemporary houses, for homes with a classic lean, city apartments, country homesteads. There are designs for all nurseries, kids rooms, tweens & teens, bringing kids rooms to life. 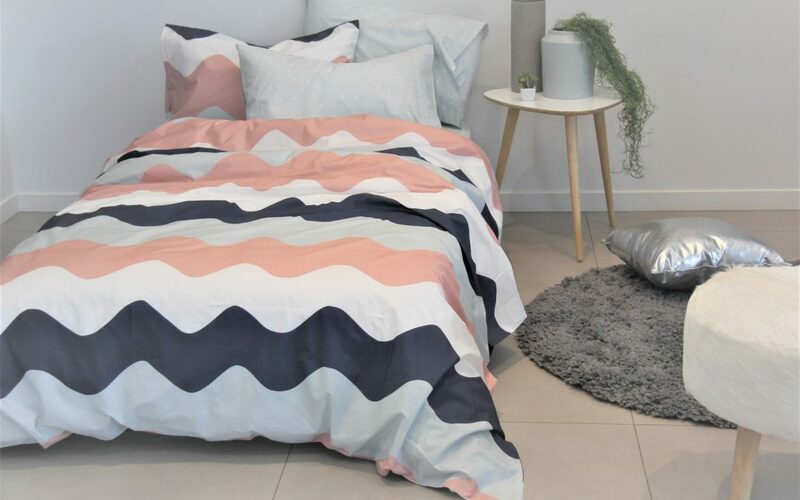 Our Charlotte quilt cover / doona is seriously Gorgeous ( yes! with a captial G ). Aimed to please our younger girls, the Charlotte quilt cover / duvet combines pretty florals, with classic stripes and splendid spots and incorporates the latest fashion colours – duck egg blue, soft pink, sage green & red. Beautiful detail, yet divine & ultra pretty, the Charlotte quilt cover / doona makes your girls bedroom space an elegant place to be.